UNITED NATIONS, July 20 (APP): Pakistan’s Ambassador to the United Nations Maleeha Lodhi has briefed the UN Security Council President, Ambassador Koro Bessho of Japan, and top U.N. officials on the deteriorating situation in Indian occupied Kashmir during which she called for an end to impunity and brutal repression of innocent civilians by occupation forces. In a series of meetings, including with UN Secretary-General’s chief of Staff Edmond Mulet and Under Secretary General for Political Affairs Jeffrey Feltman, as well as in her address to the General Assembly, the Pakistani envoy underscored the need for fulfilling the right to self-determination to the people of Kashmir and justice for victims of such heavy handed Indian tactics, according to a press release of the Pakistan Mission to the UN. Widespeard protests erupted in Indian occupied Kashmir in the wake of the killing by Indian troops of popular Kashmiri youth leader Burhan Wani 12 days ago. Resorting to brutal tactics, Indian security forces have killed over 44 Kashmiri civilians and wounding more than 1,500. Indefinite curfew has been imposed and ‘shoot-at-sight’ orders given to the occupation forces to deal with violators. During her meetings, according to the press release, Ambassador Lodhi also reminded the United Nations of its longstanding commitments to the people of Jammu and Kashmir under several UN Security Council resolutions. She argued that the human rights situation in Jammu & Kashmir was worsening because of non implementation of UN Security Council resolutions calling for a plebiscite and exercise of the right of self-determination by the Kashmiri people. 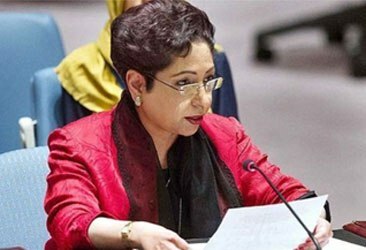 Ambassador Lodhi said that the worsening situation in Jammu and Kashmir merited attention by the world body, as it posed a grave threat to regional peace and security. She informed her interlocutors that over 100 Kashmiri youth risked losing their vision because of the brutal use of airgun pellets by Indian forces. She called for an “independent and transparent” inquiry into the extra judicial killings in Indian occupied Kashmir. Dubbing the Kashmiris agitating for their right to self-determination as “terrorists” was a travesty of truth and was further inflaming passions, she argued. The Pakistani envoy was informed that the UN Secretary General was concerned about the deteriorating situation in Indian-held Kashmir,and that he was ready to mediate peace talks between India and Pakistan provided the two neighbours accept his good offices. The Pakistani envoy called the use of excessive force against civilians exceedingly deplorable and condemnable. She said that the leaders of the APHC ( All Parties Hurriyat Conference) have all been confined to house detention. The continued imposition of a curfew has brought life to a halt and is causing mounting hardship to the people. The crackdown on the media represented a vain effort by the Indian authorities to conceal the truth about what is happening from the world. The international community must call on the Indian government to honour its human rights obligations and its commitments to peacefully resolve the Jammu and Kashmir dispute in accordance with UN Security Council resolutions, she added. Meanwhile, Pakistan’s advisor on Foreign Affairs Sartaj Aziz has written a formal letter about the grave Kashmir situation to Secretary-General Ban Ki Moon and the President of the General Assembly, Mogens Lykketoft. On Pakistan’s request, the letter has been circulated to UN.